Chris Coghlan ripped a one-out home run off Mariners closer Steve Cishek in the top of the ninth on Friday to lift the A's to a 3-2 victory and spoil the night for a sellout crowd at Safeco Field in Seattle's home opener. "I've seen him throw, I had never faced him, but he's a great closer," said Coghlan, who was teammates with Cishek in Miami. "It's not a comfortable at-bat. It's a grind facing him, because he tries to backdoor a couple sliders then tries to sneak one in. I don't know if he pulled it or what, but I was grateful I was able to get it." Coghlan, acquired in a trade from the Cubs in February, went 2-for-4 with two RBIs, and his first home run for the A's snapped a string of 11 consecutive scoreless innings by the Mariners' bullpen to open the season. "That was just a good piece of hitting on obviously way too good a pitch at that part of the game," said Cishek, who left a fastball over the plate on a 1-2 count. "I was trying to elevate a little more and I didn't get it up there, and he put a good swing on it. I felt great out there. I just didn't execute that pitch." Taijuan Walker gave up two runs on seven hits -- including a solo homer by A's designated hitter Josh Reddick in the fifth -- in a six-inning outing in his season debut for the Mariners. A's left-hander Eric Surkamp, called up from Triple-A to fill in for injured starter Felix Doubront, allowed two runs on four hits over 4 2/3 innings in his first Major League appearance since 2013. Ryan Madson notched the save for Oakland, his second this season. Robinson Cano, who had homered four times in Seattle's first three games in Texas, went 1-for-4 with a broken-bat single in the third. Big boy blast: The Mariners weren't getting much done against Surkamp until Dae-Ho Leeled off the fifth with a home run, the first hit of his Major League career a high-arching blast that cleared the wall in left center and was projected at 396 feet by Statcast™. The 6-foot-4, 260-pounder from Korea hit 31 homers in Japan last year, but was 0-for-4 with two strikeouts with the Mariners until he unloaded on Surkamp's 88-mph fastball. Ketel Marte followed with a sacrifice fly later in the inning to tie the game at 2. 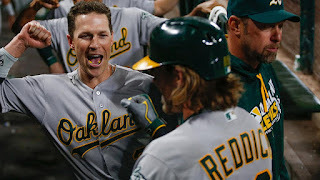 Homer happy: Reddick was relegated to DH duties because of back tightness, leading the A's to start Coghlan in right field in his stead. Both responded with key home runs, the first for each this season. Coghlan has totaled two hits in each of his first two starts and will continue to bounce around the field as the A's find ways to get him into the starting lineup against right-handers. "It made a loud sound," A's manager Bob Melvin said of Coghlan's homer. "He's a tenacious guy. We're finding out a little something about him. He likes to play, and obviously the biggest guy in the room tonight." Walker works out of trouble early: Despite being amped up in front of a capacity crowd for the home opener, the Mariners' 23-year-old right-hander handled some early adversity, stranding four runners in the first two innings. A 4-6-3 double-play grounder by Danny Valencia got him out of the first after singles by Billy Burns and Reddick had runners on the corners with just one out. And after errors on Kyle Seager and Cano put two aboard in the second, Walker dug in and struck out Marcus Semien on a 96-mph heater. "I feel that's kind of where I matured this year, just controlling my emotions and really just making good pitches to get out of big jams like that," said Walker. What a relief: Surkamp would have completed the fifth had second baseman Jed Lowrienot botched a potential inning-ending double-play ball off the bat of Cano, but Lowrie's second error of the night marked the end for the lefty, leaving runners at first and third with one out for right-hander Fernando Rodriguez, who promptly ended the frame to keep the game tied by getting Nelson Cruz to ground into a double play. Rodriguez also pitched a scoreless sixth, and he hasn't allowed a run in 4 2/3 innings in this young season. "No room for error," Melvin said. "Everybody pitched well, but Fernando was in a spot where he had to almost be perfect. He kept the ball down when we asked him to keep the ball down. All the other guys followed suit." Friday's attendance of 47,065 was the largest Safeco Field crowd for a regular-season game in ballpark history, breaking the previous mark of 46,596 set on May 9, 2004, in a game against the Yankees. The Mariners sold some standing-room-only seats for the game and paid attendance always fluctuates based on the number of comp tickets issued. A's: Left-hander Rich Hill will be on the mound for the A's in Seattle on Saturday, looking to rebound from a disappointing debut in green and gold. Hill lasted just 2 2/3 innings in an Opening Day start against the White Sox on Monday -- pitching one day ahead of schedule in place of an ill Sonny Gray -- and allowed four runs (two earned) and three hits. Mariners: Right-hander Nathan Karns makes his Mariners debut in Saturday's 6:10 p.m. PT game and will be pitching at Safeco Field for the first time in his career. The 28-year-old was acquired in a trade with the Rays after going 7-5 with a 3.67 ERA in his first full season in the Majors last year.